As our museum time-line starts to take shape, and I am finally designing intricate details for a real building instead of a pipe dream, it would be useful to have a few more pre-Victorian pianos, so if you know anyone who is willing to donate any kind of Georgian piano, clavichord or harpsichord, in any condition, please let us know. With modern eyes, many people have fixed ideas about what “upright pianos” should look like, so I have described the subjects of this page as “vertical pianos”. Long before pianos existed, there were upright harpsichords, instruments sometimes known as Clavicytherium, the example on your left. In the 1730s, just after the death of the inventor, Cristofori, his pupil Friederici and another Italian maker - Del Mela - made brief experiments which turned the shape of a piano on its end, raised off the floor on legs like a clavicytherium, to form a sort of “Upright Grand” although terms like that were not used until much later. Friederici made another in 1745, but these experimental pianos were not followed up for half a century. The pyramidal shapes shown here began to appear in the 1780s, based on a development of those earlier designs of Friederici and Del Mela. Appropriately to their name, some of these are decorated in Egyptian style. Nearer 1790, there were upright grand pianos in various forms, but still raised off the floor. Apart from his 1787 patent, I have been unable to find any details of John Landreth, (or Sandrith) who made upright grands in Hoxton, London. By 1816, there was already confusion, when ads like this one promised a “Grand Piano-Forte”, but it turned out to be an Upright Grand, some of which were as much as nine feet tall, and not the kind of thing that ordinary working people could afford or accommodate. Interestingly, this is also the earliest known reference to an “upright” piano in The Times. William Southwell made instruments on a slightly different principle in the 1790s, but again, raised off the floor, so they still didn’t make use of that vital space below keyboard level. 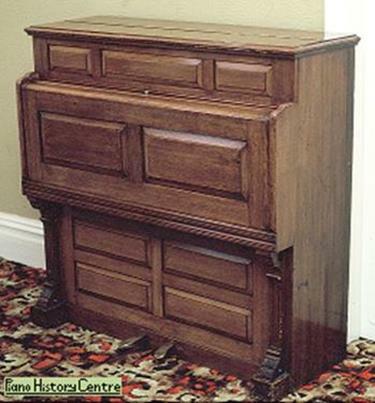 David Wainwright said that information found in the Broadwood archives suggests that Southwell’s idea for a vertical or cabinet pianoforte came from a sketch given to Southwell in 1804 by James Broadwood, but the type of instruments shown above pre-date this, starting in the 1790s. On your left is Kenneth Mobbs’ 1798-9 piano, the others are my own pictures, created from parts of Southwell’s patents, but according to the Patent Office, these enhanced versions are my own “intellectual property”. I am grateful to Margaret Debenham. Internally, these instruments were like a querpiano (square piano) turned onto its side, and Southwell called them Cabinet Pianofortes, or Microchordons, although both of those terms were later used differently. Collard made something similar in 1798. It is difficult to see the point of this design, it takes up as much floor space as a square piano, but is much taller, yet gains no apparent musical advantage from that height. Southwell’s 1802 “New Patent Microchordon”, also known as a “Camerachord”, was very similar to his 1798 patent, apart from having extra notes. In 1811, Southwell made a “piano sloping backwards” that looked similar to his others… but sloping backwards. Button & Whitaker imitated Southwell’s designs by simply fixing a tall cupboard on top of a square piano, and drawers beneath, so most of what you would see is not piano at all. Other variations in the idea of the Upright Grand Piano Forte include Lyre Pianos, which have lyre-shaped cases, and are usually raised off the floor. You can sometimes see them in old American films. Giraffe pianos first appeared around 1798, and they made use of that vital space below keyboard, to allow a longer string length, for better tonal quality. Do they look like giraffes? I am grateful to Christopher Hogwood and Ryan Mark for this extract from a rare label showing various types of Upright Forte Piano made by Martin Seuffert, Vienna, around 1819. Although the god of music and poetry is commonly used as a name in the music trade, I have never seen a surviving example of this particular “Apollo”. The “Harfen” (literally a harp) is quite likely to be mistaken for just another Giraffe Piano. From the early 1800s, when some upright pianos were enclosed in a rectangular cabinet all the way to the floor, and the height reduced somewhat, by taking the strings below keyboard level, they were known as RECTANGLES or, more commonly, CABINET PIANOS, borrowing Southwell’s term. Schrank is the German term for a tall, rectangular cupboard with double doors, also applied to these pianos. 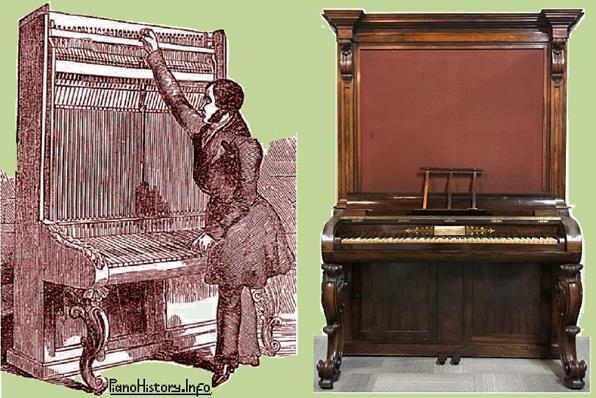 They often had a “curtain door” or silked front, and resembled later upright pianos, but were still very tall, as you can judge by the long-armed Broadwood tuner of 1842, on the right. Cabinet pianos usually have a Sticker action, not as efficient as later upright actions. Broadwood made cabinet pianos from 1811, and the early ones had 61 notes F-F.
By 1822, some had 78 notes C-F. By 1853, cabinet pianos were very much on the way out, and Tomlinson wrote that they were only one in every thousand of the pianos being made in London. Broadwoods made their last in 1854. It would be remiss of me to talk about early upright pianos without mentioning a tiny yet revolutionary example that was made by Richard Horsburgh in Edinburgh, 1786, invented by Domenico Corri “to be carried and played in post-chaises". It is now at Goodwood House, and it appeared with Arthur Negus on the cover of Radio Times in 1982. It was restored by John Paul, and when he sent me photos back in the seventies, I wrote to Goodwood to ask if they understood what they had there. Although it was designed purely for portability, it is important as the earliest known upright piano to make use of the space below the keyboard for strings, in fact all of the string length is below keyboard, so it is also arguably the first Minipiano. Small upright pianos as we know them hardly existed at all before about 1810, but although it is often said that Robert Wornum invented them, they already existed in some forms before he and Wilkinson made them. A small 1810 example by Wilkinson may be found at Palace Pianos. What Wornum did was to invent the upright piano action in 1826 that was so good, it has become universal. Our 1842 example still works very well, without major renovation. However, Wornum was not one for art and decoration, and his very plain, functional casework is often mistaken for being much more modern. Modern ads for the Challen company used to show a sketch of a supposed Challen upright piano from 1804, but although the new Shanghai company has been renamed as “Challen 1804”, William Challen wasn’t in business in his own name then, he was in partnership with Alexander Watlen until 1837. We have a Watlen & Challen square piano. The Museum of Fine Arts, Boston, has a small upright piano by Robert Woffington, Dublin (said to have been owned by Lady Morgan, author of “The wild Irish girl”) which they think was made around 1790, based on its furniture style. When the Woffington was “restored”, its appearance was completely altered. Finchcocks (now closed) had another Woffington. I feel it is unlikely that such small uprights existed quite that early, and would be inclined to place it nearer 1798, but it may have been made after the so-called “Portable Grand” patented in Philadelphia, 1800 by the London engineer and inventor John Isaac Hawkins. There seem to be 2 surviving Hawkins examples, said to be dated somewhere between 1801 and 1803, one of which I examined in detail at an auction, when the Broadwood Collection was sold. The other is in the Smithsonian collection. History does not record whether Hawkins may have copied the idea from Woffington, he had moved to America in 1790, returning in 1803. There were still very few similar instruments by 1810. 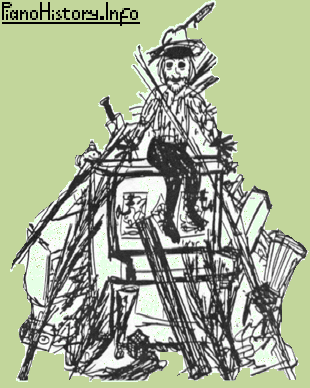 Interestingly, Hawkins used a simple, early form of iron frame, running around the outer edges like a picture frame. In the top edge, the tuning pins ran on screw threads, which attempted to give smoother, more controlled tuning. Throughout the 1800s, there were fairly small upright pianos made with fold-away keyboards, either for portability, or as a space-saving feature. Despite many internet references, in half a century of research, I have been unable to locate one single, genuine example where any manufacturer described any of them as a SHIP’S PIANO. (After all, a ship is big enough to have any kind of piano it wants, and some of the ocean liners have full concert grands.) Hawkins called them “Portable Grand Piano Forte” although there was nothing “grand” about these little instruments. At the Great Exhibition, 1851, Jenkins exhibited them as “Registered Expanding & Collapsing Pianoforte for gentlemen's yachts, the saloons of steam vessels, ladies' cabins, &c.” so gentlemen got a yacht, but ladies only got a cabin! Not only that, Jenkins’ labels couldn’t spell “collapsing”! Collards called them “Contractible Pianofortes”. Some of the examples which Aucher Freres, Paris, are alleged to have made around the mid-1800s seem to have set the style for most others, and at the Melbourne Exhibition, 1880, Aucher claimed originality for the fold-away keyboard, but the catalogue says “this invention is well-known and adopted by so many French makers as to be hardly worth notice, unless it is as a specimen of workmanship in accurate adjustment”. Metzler & Co. produced 7-octave versions, and the example above, owned by The Friends of St Basil, Toller Fratrum, is thought to date to about 1888. Usually, a Yacht piano has a type of action based on Robert Wornum’s 1826 patent, much more efficient than a Sticker action, and they often survive a century or more in playable condition. This action was ignored by London firms, but imitated and improved by French makers in their “Pianinos”, before people like Broadwood began imitating the French version in the 1860s. Chappell & Co. called them YACHT PIANINOS, and Cramer & Co. called them YACHT PIANOS, which became the most widely-used term for them. In reality, such instruments were not necessarily used in yachts, they were a popular choice for small rooms, but we have heard of one that was used on a Norfolk wherry. Upright pianos are dangerously back-heavy, so if they are used on a ship, they need to be firmly attached to the bulkhead, or screwed to the deck like the Titanic’s grands. Some were fitted with large lead weights. It is important to remember that “yachts” could be quite large ships, like the Royal yachts, owned by very rich people, so some Yacht Pianos are highly decorated. This 1894 Rogers Yacht Piano owned by David Browning, is honestly labelled "Manufactured expressly for J.B.Cramer & Co." so perhaps Rogers made all of Cramers’ Yacht Pianos. David was searching the net for information on his piano, and was amazed to see a picture of it on my website. I used to tune it for his mother. Various London department stores sold Yacht Pianos, including John Barker and Whiteleys. In modern times, the Challen 988 model on the right had a keyboard that could be folded right down for transit, to assist in getting it through difficult doorways. and (unaware of the fold-down keyboard) got it stuck in the doorway. He abandoned it and fled! Our collection includes upright pianos dating back to the 1830s, often still playable, although not as efficient or powerful as later instruments. Tuning can be a problem, but it is often possible to tune them well enough to demonstrate the sound, and it is interesting that completely untuneable pianos are more likely to be from the 1900s. Without donations, I will be fine, but our collection may not survive. If every visitor to this site made a donation, we would be able to do more with displays in our museum building, and have much-improved facilities for research within our own archives.